I really wanted to explore more of the area and visit all of the gigantic mountains that I had seen in other photos but the area was hit with a pretty big snow storm and road conditions confined us to the closer Banff area, with a few trips out towards Lake Louise and Peyto Lake; I was definitely glad for the 4-wheel drive vehicle After days of exploring the same few areas I told Willie I needed to see sunrise at a new spot. We werent sure if the weather forecast would be accurate but at the last second we decided to head to the Tunnel Mountain viewpoint, which looks out onto Mount Rundle. 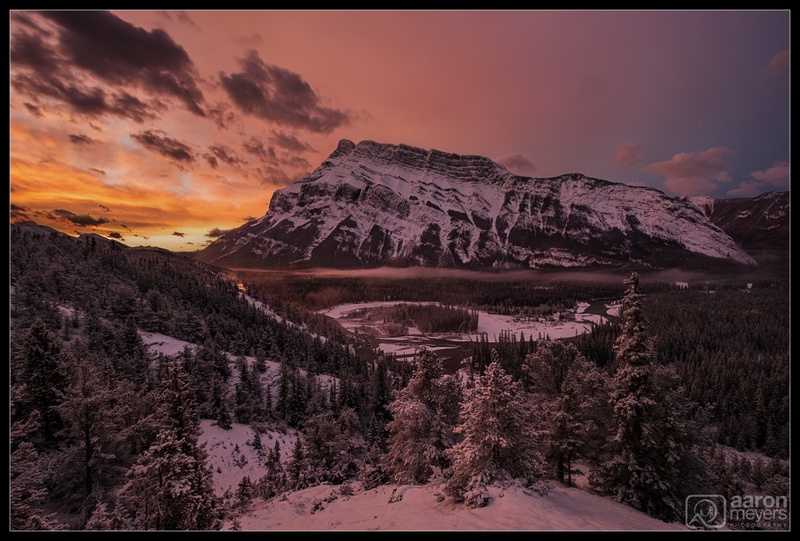 The Bow River snaked below us and an early morning snow storm draped the evergreens in white just as the sunrise lit the sky in reds, oranges, and pinks. I loved how even the fog and snow picked up the purple-red color of sunrise.